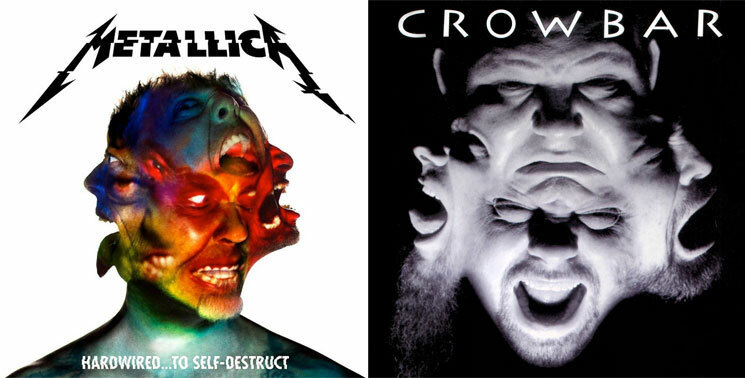 While Metallica revealed the face-blurring, tongue-brandishing cover art to their Hardwired...To Self-Destruct yesterday (August 19), along with the rest of the album details, Crowbar guitarist/vocalist Kirk Windstein says he's seen that kind of thing before. Namely, via the member-merging artwork found on his own band's 1998 collection, Odd Fellows Rest. Windstein jumped onto Facebook shortly after Metallica unveiled the jacket art to take the piss out of his onetime tourmates. While Windstein clarified that his on-the-road time with James Hetfield and Lars Ulrich took place while he was playing with Down, "the fellas know who Crowbar is." Windstein's tone is pretty playful, considering he "seriously" doubts that the Bay Area Big Four greats pinched the cover direction. But while he's pardoned Metallica, he appears to have some questions for Hardwired art director. CORRECTION (8/23, 12 p.m. EDT): An earlier version of this article stated that John Buttino was Metallica's art director. However, Buttino was in fact the art director behind Crowbar's Odd Fellows Rest. As previously reported, Metallica's Hardwired...To Self-Destruct double album is out November 18 via the band's own Blackened Recordings. The record is currently being teased via a video first single "Hardwired," which you can see below.